The purpose of the programme is to provide strategic management and administrative support services to the line function of the department. It also supports the Ministry and the Office of the Head of Department. Administration manages and renders corporate functions to the department, which includes two sub-programmes: Financial Management, and Strategic Services and Communication. Aims to improve the department's financial management. Aims to improve control measures and provide support for strategic direction. Institutionalises processes for dealing with non-financial performance. 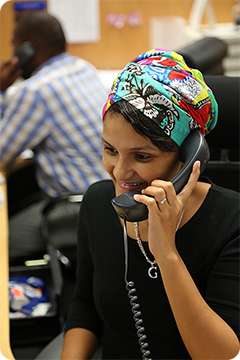 The Department also values community feedback, and encourages all citizens to make use of our information helpline. By texting the word “INFO” to 35 395 (SMS charged at R1) citizens will receive an automated menu of services. The menu of services will invite the citizen to SMS any key word, on the list provided, which will grant the user access to safety information. EG: If you SMS word “Complaints” the department will then contact the citizen to get more information in order to take the matter further. If you text the word “PNP”, you would receive information about our community policing needs and priorities meetings. Upon using the service, contact details are stored on a database, and the Department is then able to inform communities of events, and programs in their respective areas. An opt out function is available at any given time. Having shared the above, it is safe to say, that DOCS is committed to creating safer communities, Better Together.